Why Choose WEILIANTE Mini Multimedia Video Projector? Support AV/VGA/USB/HDMI slots and wireless Miracast/Airplay connection, which makes it possible to connect Laptop, Amazon Fire Stick, Roku, Tablet, DVD Blue ray, XBOX, Smartphones to this projector. Portable and compact Design for easy installation and support Keystone Calibration for better picture quality. Equipped with upgraded LED source technology to project a clear image, 800 x 480 native resolution, max support 1080p. 2018 Edition Provides a brighter image than other similar projectors. You will get a better visual experience. Various multimedia AV/USB/HDMI/VGA ports to satisfy your different needs! Earphones and Speakers with 3.5mm AUX in PS3/4, Wii, Xbox, MP5. 1. Wifi function only Support IOS 9.0 and above system; Android 4.4 and above, at present not support iPhone X. 2. Copyrighted content cannot be mirrored or screencast by wifi. 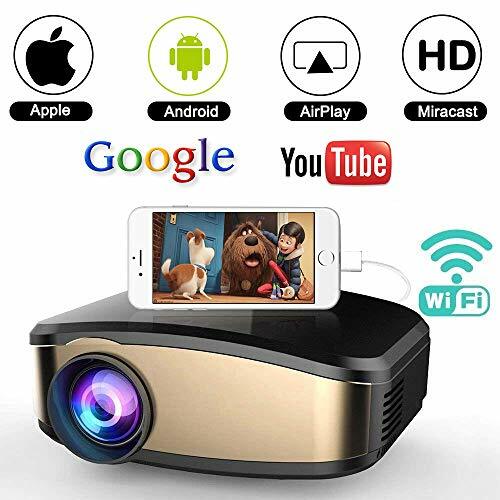 【2018 New Version Wireless Projector 】- WEILIANTE Mini Video Projector can project directly from your iPhone/Android smartphones through wifi, you don't need to order the variety of adapters anymore! ; Plus, compared with other similar, WEILIANTE updated edition add a special function. For IOS system, plug an Apple lightning cable to the USB port of WEILIANTE Video Projector, you can also enjoy a Big Screen instantly!More Choices for you! 【Multiple Connectivity】- Apart from Wifi, Rich connection from HDMI/VGA/AV/USB connectors, WEILIANTE Multimedia Portable Projector is compatible with TV Box, Amazon Fire TV Stick, ChromeBook, PCs, Laptops, Tablets, Blue-ray DVD player, USB Flash Drive, Media players (Music, Pictures, Video, TXT), iPad, iPhone and Android Smartphones. 【Excellent Picture Quality】- WEILIANTE WIFI projector native resolution is 800*480, and it can support the highest resolution of 1920*1080. The aspect ratio is 16:9/4:3, with 1200:1 contrast ratio. Ideal for providing vivid and clear images in the dark with this mini video projector. Projection Method: Front, Rear, Suspended Ceiling, you can watch movies and sport matches, Play game at home, in your courtyard or garden. 【True Big Screen Experience】 - An excellent combination of ultra-big screen(35"-130"), high resolution images Support 1080P and vivid color, this Home Projector provides up to 130" on virtually any wall or screen and 1200:1 dynamic contrast ratio for rich detail in different scenes. For the Best Suitable Watching Experience, 90'' Size Screen, Nice for Watch Basketball/Baseball etc Game. 【HIGH QUALITY ASSURANCE & WARRANTY】*Hassle-Free Return/Replacement* The projector comes with a 3-year warranty and top technical support is on standby. WEILIANTE Co.,Ltd. also provides Free of Charge warranty for any projectors parts or lamps replacement! If you have any questions about this product by WEILIANTE, contact us by completing and submitting the form below. If you are looking for a specif part number, please include it with your message.